First of all, asked in principle: What does the consumer actually expect from packaging nowadays – do you see a clear development? If the answer is comprehensive, the consumer expects clear communication and perceptible added value from the packaging. Communication must highlight the strengths of the brand and the product precisely and simply. A potential added value can be functional, such as a practical removal aid, a reclosure or ecologically advantageous packaging. Or we create emotional added value through the packaging and open up worlds of experience for the consumer, for example, which clearly position the brand and the products. This can be completely different from market to market and from industry to industry. In addition to the long-running topic of “convenience”, however, consumer trends are currently clearly moving in the direction of sustainability, regionality and individualisation. And the heading “digitalisation” is already making many of our customers sit up and take notice. One can still get the impression that the big advertising campaigns of a company are the responsibility of the management or the board of directors, whereas the packaging is rather under the way – or what are your experiences? Of course, the importance of packaging within a company varies greatly from customer to customer. Our customer, the Rügenwalder Mühle, for example, has placed the subject of “packaging” at the top decision-making level. And developments like the cup of the “MühlenWürstchen” also revealed the enormous potential that exists in the close interaction of a differentiating packaging and a strong communication advertising spot: Jörg Pilawa reported at the time along the entire TV spot solely on the advantages of the new sausage cup. But you’re certainly right: many companies still have more budget available for classic advertising than for new developments such as packaging and packaging design, which is the actual core of the product. From the point of view of most designers, reduction is a prerequisite for the intuitive functionality of packaging. At the same time, legislators are imposing more and more requirements for the necessary information to be printed on the packaging. And companies also want to use packaging to communicate as many messages as possible, which can also easily lead to overloading and possibly even deter impulse buyers who are overburdened. How do you deal with this dilemma – creatively, but also from the point of view of brand management and good sales figures? We are only too familiar with the problem of the informal and thus also graphic overload of packaging. In many cases, the reason for this is certainly the uncertainty of those responsible for brands and products, who would rather name 5 product benefits than one real one. Even more often, however, the cause is deeper, hidden in the brand and product identity. Our strategic approach therefore starts with our customers on the one hand with the brand and its definition, positioning and architecture as well as with the product and the elaboration of a clear “Reason Why”. Why should I prefer and buy the product in question over other comparable products? For our customer Nestlé Wagner, for example, we had already been able to work out these basics clearly and unambiguously during the product development of the new product “Rustipani” and were thus able to generate an absolute success story in the frozen food sector. Everyone likes to talk a lot about the sustainable use of resources, but in packaging reality the examples of reusable packaging still seem quite rare. Or what is your impression – is there movement in the matter? 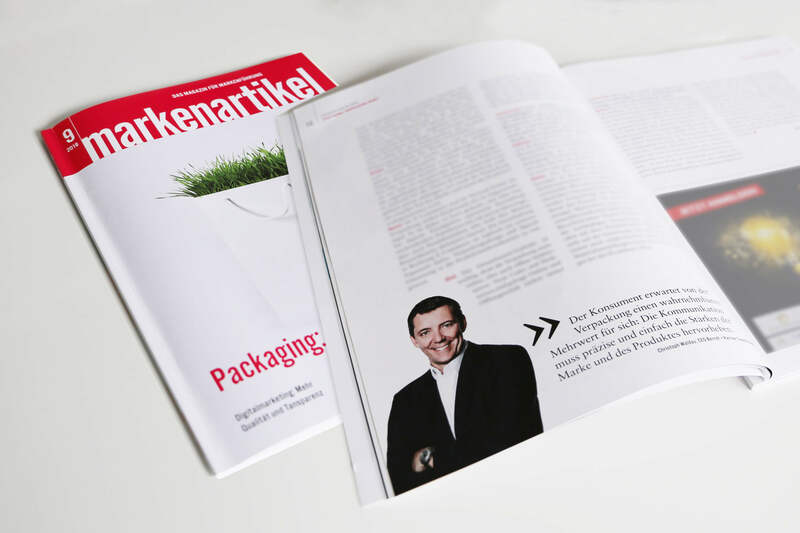 The call for sustainable packaging solutions is certainly louder than ever before and we also assume that it will not become quieter. Accordingly, there has been a lot of movement in the industry. We distinguish between two basic approaches to the packaging to be used: reduction, for example by using thinner or fewer materials, and substitution by more environmentally friendly materials in production and recyclability (keyword “Design4Recycling”). Without exception, our customers have sustainable packaging at the top of their list of priorities. However, the current comparatively high costs for material conversions and the very low margins for the products themselves are obstacles in terms of implementation. Packaging Design is also and especially affected by the increasing shift in retail towards e-commerce. But what does the channel shift in the purchase of goods actually mean in concrete terms for packaging design: is it becoming less important because the customer buys the product online, i.e. does not come into contact with the packaging until after the purchase? Or is the opposite the case? With regard to the change from stationary to online retailing, we will see dramatic changes in the coming years. Our network partners in China and the USA are already experiencing much greater shifts here than we are here in Europe. For this reason, we recently conducted an internal study to examine the effects this will have on fast moving consumer goods in the future. It becomes clear from this that the relevance of the actual primary product packaging for online purchasing decisions will depend to a large extent on how strongly the packaging is perceived as a visual part of the brand and thus of the product. The herb butter of our customer Meggle, for example, is inseparably linked to its cylindrical tubular packaging for the consumer. The illustration of the herb butter alone would certainly not lead to a positive purchase decision without further ado. With regard to the transport of the products and thus also with regard to the transport packaging, however, our study also shows great development potential, where branded companies should take action at short notice, for example with regard to presentation and emotional confirmation of purchase when receiving the goods at home or even in the direction of solution approaches such as “product packaging = transport packaging”.